Since Costco has a $4 coupon for the Boneless Pork Loin I bought a 5 lb. one today and am open for suggestions as to the best way to cook and prepare it. I don't often make pork or roasts for that matter so I am open for suggestions. I am thinking of using a rub of some kind using olive oil and some herbs or seasonings. I have looked up some recipes and some say to cook it at 400 degrees for the first hour and then lower to 250 or 325 (two different recipes). Does that sound like a good idea? The last time I made a pork roast I cooked it at a straight 350 degrees at about 18 minutes per lb. The last pork loin I bought at Costco, I cut in half. Cooked one and froze the other. The first one I just roasted like I did 30 years ago. It was dry and tasteless. The pork today is being bred for leaness. Fat adds flavor and juiciness and tenderness. None of those good things are present in a solid hunk of muscle with no marbling. The second roast, I brined for about 2 hours in 2 quarts water to 1/4 cup each salt & sugar. Then I patted it dry, rubbed it with seasoning, and browned it on all sides in a skillet. Put the whole skillet in a 375F oven for about 20 minutes per pound. It came out beautifully rosy, juicy, and tender. Here's a link to the thread I posted on a similar subject just this weekend. On page 3 I posted a pic of the final product and below is how I cooked it. I just ate the last leftovers for supper tonight. It was still very moist and tender. The recipe called for the pork loin (I'm sure they intended a "clean", unaltered loin). I rinsed and dried mine to get as much of the "seasoning" (I use that word very lightly here) and patted it dry. The recipe called for a seasoning rub of: garlic powder, oregano, cumin, coriander, thyme and salt. I had everything except coriander so I substituted with a Lemon/Herb blend I had. Then brown all sides in garlic infused olive oil. Bake for 20 min. (I checked w/ thermometer and it wasn't done so I added 10 min.) It came out very, very juicy and flavorful. If anything it was a little too salty....no doubt from the seasoning/preservative junk they put in it. Also maybe a little too "thyme-ey". Overall, though, not too bad. Baked at 450 for 30 min. total. Good luck! Just don't overcook it. I was going to ask if it would be OK to cook half and freeze the other half. Since it is such a large roast, unless I am having company, it would be better to cook only half. I don't know how the Costco pork will be but over the holidays I bought a pork loin roast at Trader Joe in New York (where I was visiting family). I roasted it at 350 degrees and cooked it about 18 minutes per lb and it came out very good. It was moist and tender. I have not seen the pork roast at the Trader Joe near me. Maybe it was just a holiday item. So I am going to hope the Costco one comes out as good but wanted to try cooking a different way. I don't really like brining because I don't like sugar on my food so I will have to figure out some other way. 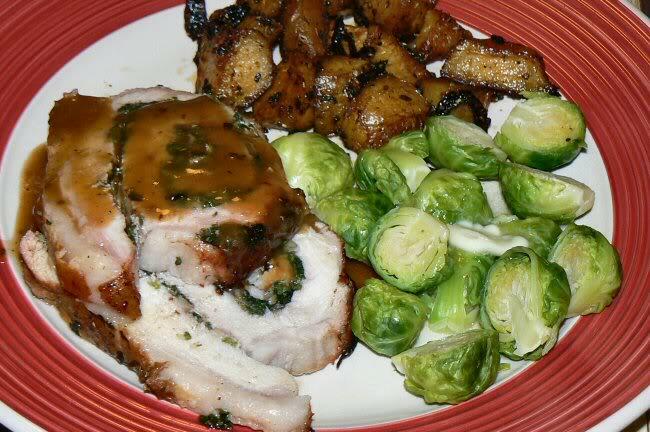 I often buy a whole boneless pork loin when it is on sale and cut it and freeze it. I cut a few small roasts and then some thick-cut chops that I can cut a pocket into for making stuffed pork chops. Ever thought about kinda butterfly'n it out, put some type of stuffing(not dressing) like sausage, herbs, etc then roll up and cook? I've never done it but would like to. I don't do many loins but when I do I put it on the smoker at 225-275* and cook to about 142-145, tent, and rest for a good 15min. Might even want to only go to 140 expecting a 5* rise in temp, carry over. Another idea might be to cut into about 1.5-2" "steaks", and stuff those like a stufffed pork chop. We generally slice a loin into thick cut chops and freeze them for later use. I really want to try that tip about salt, pepper and garlic powder on one side and salt, papper, and turmeric on the other......now where did I put that post??? Take one butterflied pork loin chop, boneless (gasp! Goodweed's cooking meat without a bone! ), and sprinkle one side with kosher salt, fresh ground black pepper, and granulated garlic powder. Stab all over with a fork. Flip the chop and sprinkle on salt, black pepper, and turmeric. Stab all over with a fork. Cook in a lightly oiled pan until the juices begin to run on top. Flip and cook for three more minutes. Remove from heat and serve hot. 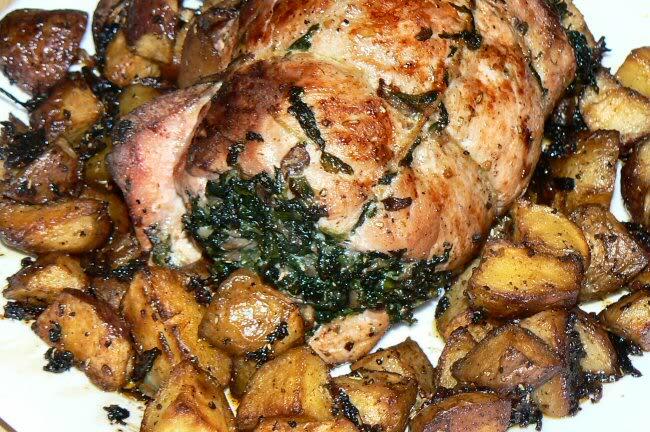 Stuffed Roasted Pork Loin - chopped mushrooms & onions sautéed in EVOO till soft, frozen chopped spinach thawed & squeezed dry added to pan, seasoned with sea salt, ground peppercorns & thyme. Butterflied pork loin spread with the spinach mixture, rolled & tied seared in pan then roasted in a 350F oven till internal temp is 160°F, about 23 - 25 minutes per lb.